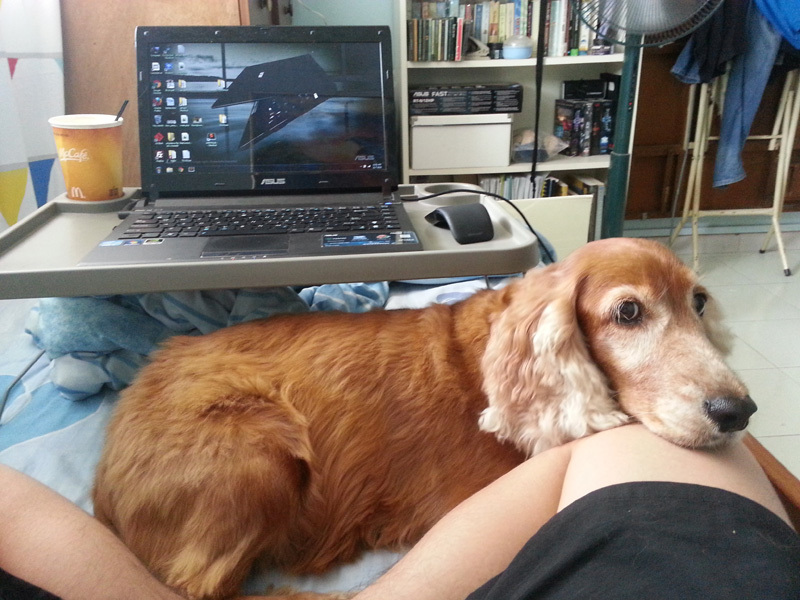 I adopted Girl Girl the cocker spaniel when she was 6 from a factory at Tuas. I’m her 3rd (and final) owner, the 2nd owner, an uncle in his 50s didn’t know much English and thus named her Girl Girl, which I didn’t feel a need to change since she responds to it. Uncle could not bring Girl Girl home cos his existing dog could not get along with her, he could only keep her at the factory, where he returned on Sat and Sun to bathe her, feed her and play with her. Uncle was retrenched and had no choice but to ask around for new adopters. On Wed, 2 Jan 2013, I was having dinner with my friend and she showed me Girl Girl’s picture. 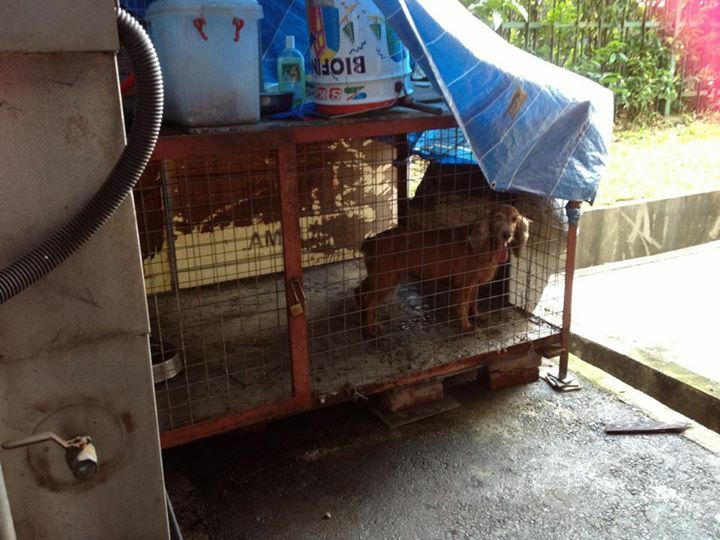 On Sat, 5 Jan 2013, I transported Girl Girl from Tuas to her foster home at Kovan. On Sun, 6 Jan 2013, 5-6 potential adopters viewed Girl Girl. Because I interacted with her the day before, she kept running out to find me. The rehomers decided to let me adopt her. It was a whirlwind. Sat I told my family I was visiting an adoption dog, Sun I brought her home. I was home for 2 weeks (before resuming uni) and spent time orienting her to her new and permanent home and establishing boundaries such as no jumping on sofa in the living room. She is allowed to roam the house. Girl Girl is grass trained, everyday I spend 10-20 mins in the morning and evening to walk her, during which I mentally plan my day and reflect. 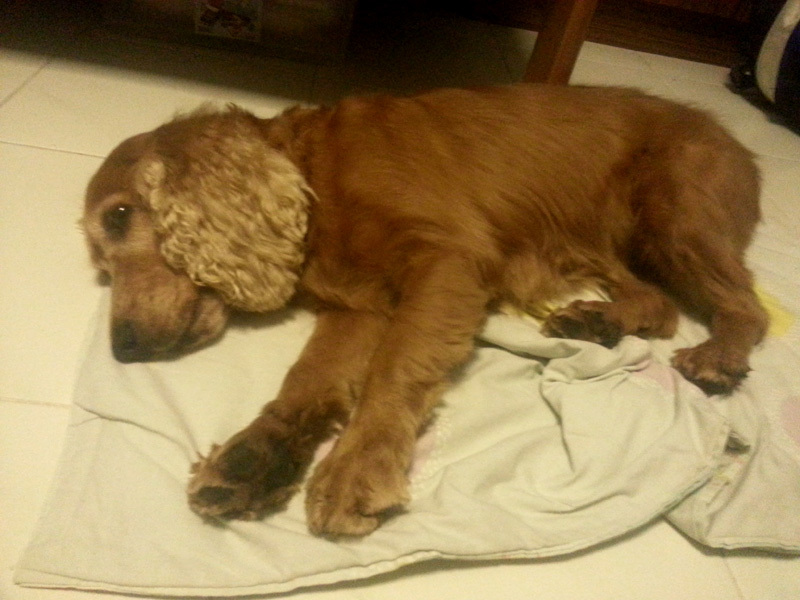 Every weekend I bathe her, every year she goes for her health checkup and vaccination. Whenever there’s a chance to bring her out, either to pet cafe or dog run, I bring her out to play. Girl Girl is very food-motivated (greedy), she follows whoever goes to the kitchen, then she sits there with her innocent eyes hoping for food. Having adopted a senior dog myself, I can tell you they’re more ‘sensible’, in the sense that they will behave themselves, having gone from ‘poverty’ to ‘paradise’. So do consider adopting instead of buying, they’re dogs all the same. This entry was posted in Titansoft Culture on August 27, 2015 by weiket. Trailblazer with keen interest and natural cognition in technology. Self-taught bootstrap, jQuery, PHP, C# etc to develop intuitive end-to-end solutions. Adept with Laravel PHP MVC and ASP.NET MVC5 frameworks.